The summer after my freshmen year of college I got a job at Raceway to Fun, a combination go-cart, mini-golf, arcade, driving range, bumper boat, auto shop, batting cage, metalworking factory, trailer park. 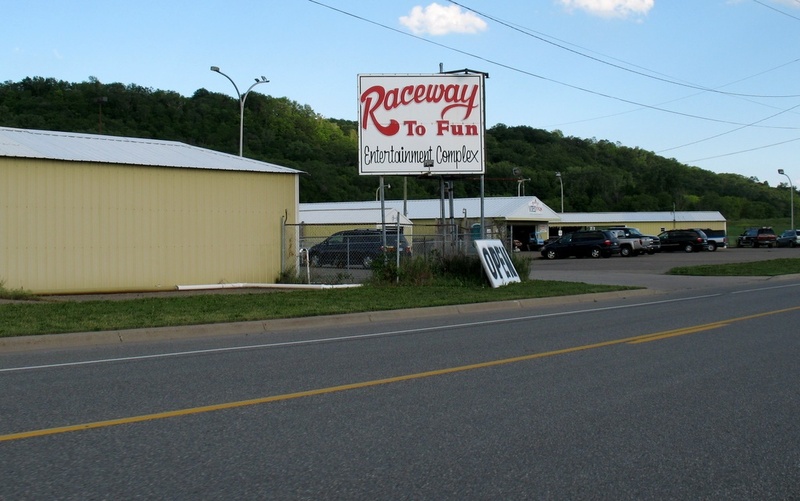 I kid you not, all of those businesses were part of Raceway to Fun. On my first day, I used a band saw and a piper bender, when I had expected to be patrolling go-kart races. It was an interesting experience to say the least.It taught me a lot about how little I know. It taught me the value of basic competency (Folks younger than me: NEVER underestimate the value of competency). That summer also taught me that I lack common sense. Twice I needed to jump my car because I left my lights on during daylight hours. Twice (in back-to-back weeks) I pulled over on the way to work and started to turn around because I thought I left my car keys at home. And on one bright day, I managed to fall into one of the mini-golf ponds up to my waist. Not that things have necessarily improved, 30 minutes ago I attempted to get in the backseat of my car and drive and just last night I burned my fingers on a piece of bacon that I had taken out the pan seconds earlier. And I bring this characteristic lack of common sense into my relationship with God as well. I am slow to believe things I know to be true. I suffer from spiritual amnesia, constantly forgetting lessons I've learned time and time again. I am prone to act as if God were entirely different than He really is. If I thought logically, if I used common sense, none of this would be an issue. This is illustrated in the story of Jonah. Jonah in his own moment of complete idiocy thinks fleeing from an omniscient, omnipresent, omnipotent God will be a legitimate option and while on the run the ship he's on encounters a huge storm. The pagan sailors on the boat desperately seek to find out what's happening and ask Jonah, "Tell us, who is responsible for making this trouble for us? What do you do? Where do you come from? What is your country? From what people are you?" As a Hebrew, Jonah would more than likely looked down on these sailors. After all, if the Hebrews are God's chosen people, those of all other ethnic groups must be God's un-chosen people. Jonah more than likely would have considered himself superior both ethnically and religiously. And in one sense he is. He knows the Truth. He's aware of the God who is in charge of everything, while these sailors gods are merely stones and wood carved by the hands of man. But Jonah isn't applying this knowledge. He's not living like its true. He's on the run. So, Jonah responds the the sailors question of his background, "I am a Hebrew and I worship Yahweh, the God of heaven, who made the sea and the land." This is not a claim the sailors were about to make about their "gods" of wood and stone. Their "gods" don't make or create or control anything. And they respond to Jonah's answer exactly as logic would dictate: They FREAK out. They are "terrified" and ask, "What have you done?" They are in the middle of a storm that is getting rougher and rougher and this stranger has just told them he's openly disobeying a direct, personal command from the God who made the earth and seas on which they ride. They are right to be terrified. Absolutely. This is a common sense I lack. Even on this exact issue, no, not surviving enormous squalls. But, being aware of God's unchanging character and his role as Creator in particular. God is in control. His plans won't be frustrated. He created all this, no matter how messed up it is, He's not flinching. In my neighborhood, only 13% of 10th graders (those who haven't dropped out yet) read proficiently. God's bigger than that. In some areas of my spiritual life, I see no growth. In fact, I'm further from God in them than I was a year ago.God's bigger than that. A few months from now I'm likely going to be in charge of planning and implementing an after school program, something I have no experience or foreknowledge of and little desire to learn. God's bigger than that too. The common sense lesson is God is big. He's in control. He's made the sea and the land. And I know something better, which the sailors learned that day, too. Though I commend their common sense, one of their logical assumptions was false. Yahweh is not a God who was seeking revenge on Jonah. He's not a god who keeps record of wrong, explodes with anger, or withholds compassion. Logic would expect a god to be so. But Yahweh is different, he responds by saving the sailors and by providing for Jonah as well. The scene ends beautifully. Upon the seas calming, standing in the presence of the evidence of Yahweh, these pagan sailors "greatly [fear] Yahweh and they [offer] a sacrifice to Yahweh and [make] vows to him."